Is it just us, or does virtually every trailer for a supernatural horror movie look exactly the same? Someone’s possessed, something jumps out at the screen, there’s a lot of flashing and a lot of screaming, blah, blah — in other words, they’re often fairly easy to ignore and are almost immediately forgotten. 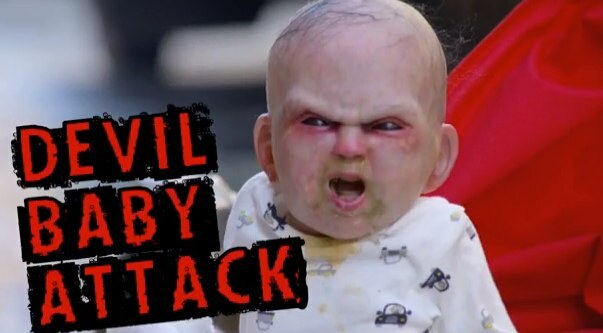 But when a demon-spawn infant comes rolling up to you in a seemingly-possessed stroller and projectile vomits on your shoes as you’re heading out for your morning coffee, not only are you suddenly paying quite close attention, but the experience isn’t likely to slip your mind anytime soon. Especially when your hilarious reaction is caught on camera and shared with the world on Youtube. Also, can we just point out one other thing? Check out the reaction of the gentleman cleaning the sidewalk at about a minute in — that dude is the most stone cold badass we’ve ever seen, and makes us wonder what horrors he’s run into on NYC sidewalks if he has exactly zero reaction to a shrieking, satanic infant.